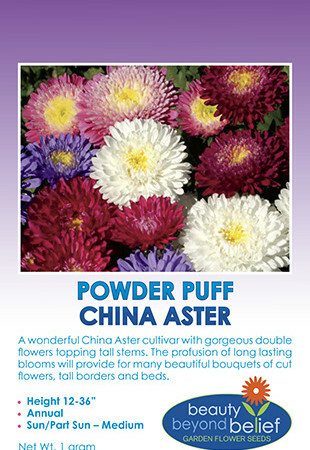 A wonderful China Aster Cultivar with gorgeous double flowers topping tall stems. This popular annual provides showy, 3-5-inch diameter blooms in a mix of colors with creamy centers from early summer to fall. The profusion of long lasting blooms will provide for many beautiful bouquets of cut flowers, tall borders and beds. Easy to grow from seed and can be planted in succession to lengthen bloom time. Deer resistant. Planting Rate: 5 oz./1000 sq. ft.